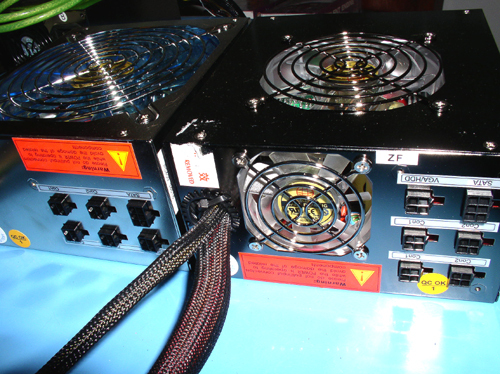 Bottom Line: This power supply exhibited a lot of the same issues as the Mad Dog. With added features like the 5-minute ramain running, the quieter 140MM fan that kept things VERY cool and the lower price scores this PSU higher than the Mad Dog. Like the Mad Dog we reviewed, people are going to consider the TTGI Plug-N Power because of power, price and modular cables. 550W is certainly a pretty powerful sounding number, and the TTGI branded Superflower power supply costs even less than the Mad Dog. The modular cables are just like those on the Mad Dog and still allow the user to only add the cables they need, keeping the inside of the case neat and clean and capable of better air-flow. Here's our TTGI/SuperFlower and Mad Dog (left to right) next to each other. Quite different looking on the outside. The interfaces for the cables are similar, but are arranged differently.